This towel which is called “TENUGUI” came from very humid Japanese summer culture. It is a thin textile, which is easy to absorbent and to dry again and not get bulky. There are many beautiful patterns so you can use not only for kitchen towel but also for scarf or decollation for your table. You can also make a bag or cushion out of it! In the Heian period (AD 794 - 1192) Tenugui was used as accessories for Shinto rituals. Cloth was such a precious item that the use of the item was not widespread among the people during the Nara period (710 - 794). From the Kamakura period (1192 - 1333) on, it gradually became popular. In the Edo period (1592 - 1868) cotton began to be cultivated in various parts of Japan and Tenugui became a necessary item for living. It was around this time that people started to regard it as a valuable item not only in terms of its functions but in terms of its artistic value. Then a contest called “TENUGUI-AWASE” became a widespread event among a certain type of people who tried to win with their original designs on Tenugui. Such competition contributed to the development of new dyeing techniques. In the Meiji era (1868 - 1912) a dyeing technique called “Chusen” was devised and it extensively revolutionized the industry. In or around the Showa period (1926 - 1989), a variety of associations were formed by people who love Tenugui and such associations spread throughout the country with Tenugui as an item which is no longer within the realm of daily necessities. 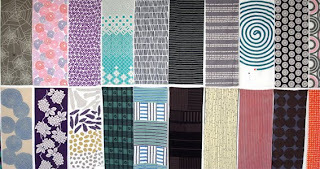 Today there are many different colors and patterns of Tenugui and people have free minds of how to use Tenugui.